Custom domains are available for any sites on a paid plan. Modifying TXT, MX/Email records is not required for setting up a custom domain. Changing those records may result in unexpected results. The only records related to setting up a custom domain name on Shifter are CNAMES, ANAMES, or ALIAS, depending on your DNS provider. Shifter uses CNAMES for custom domains. This works like a "mask" of the Shifter domain created with each site. For example, example-site.on.getshifter.io is masked with example-site.com. Before we can add a custom domain name we must first verify the domains ownership to enable HTTPs. HTTPs ensures all site traffic is secure, this is required and enabled by default. 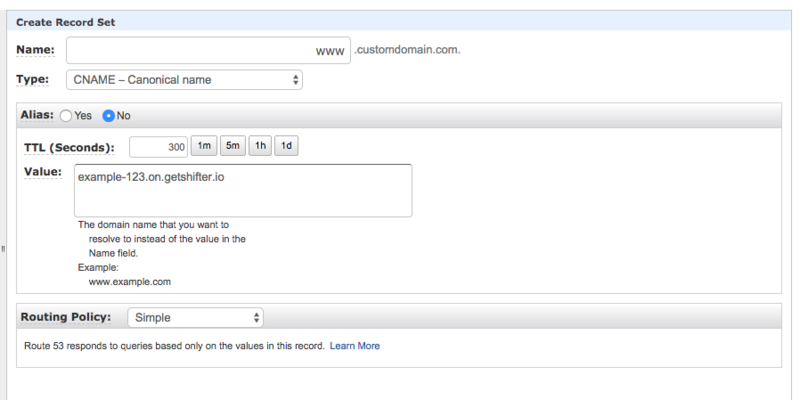 Once your domain is verified and ready we'll be adding a CNAME record like this to enable that custom domain. Before jumping into the specifics, here's a brief overview of how-to enable a custom domain on Shifter. Shifter uses only CANAME, if you have mail server (MX ), do not delete or overwrite current records. Log into the Shifter Dashboard. Navigate to the Domain Settings of your site. 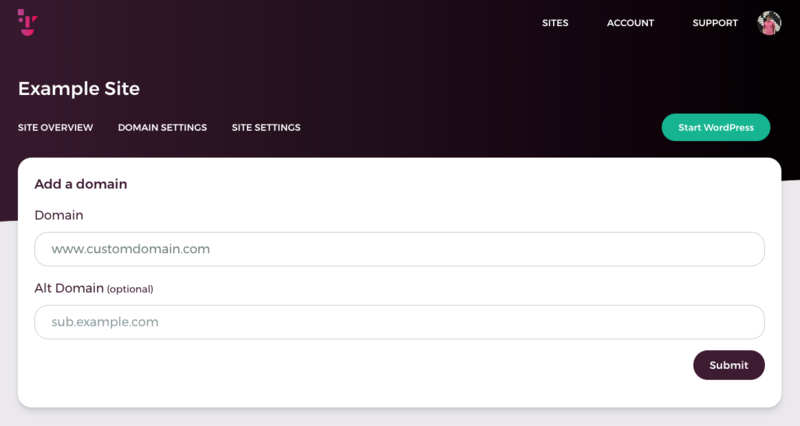 Add a valid domain using the Add a Domain form. 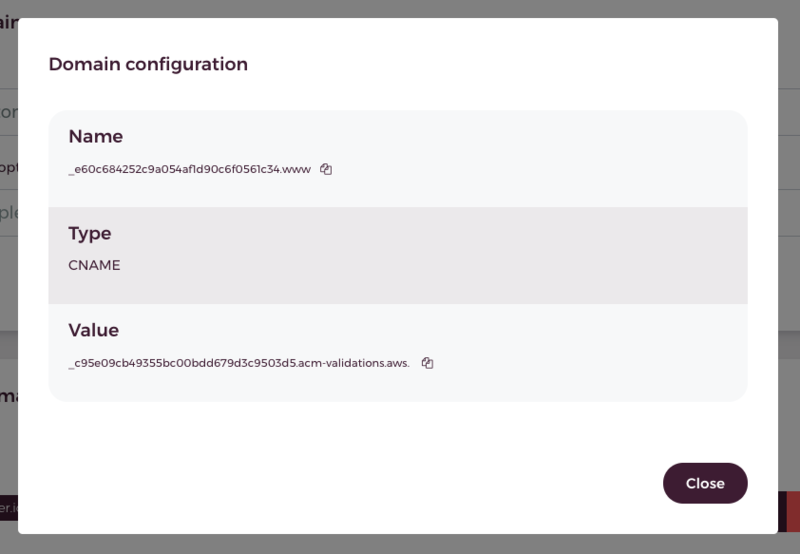 Copy your custom domain verification records. Add your verification records to your DNS. Wait for the domain status to go from pending to verified. Create a CNAME record to mask the Shifter URL with a Custom URL. Access to attached custom domain. In this example, we are using Amazon's Route53 DNS service. Depending on your provider this screen may look different however, the steps are the same. Successfully adding the these records correctly, it will only take a few minutes to validate your domain. Once valid, we can attach the domain for use. Note: If you fail to validate your domain, make sure the added records to your DNS provider is not contain your domain name. For example, if you input _abc123.www.your-domain.com , it should be _abc123.www . Please note. After attaching custom domain to and artifact, generate it again for replacing Shifter's URLs (e.g. 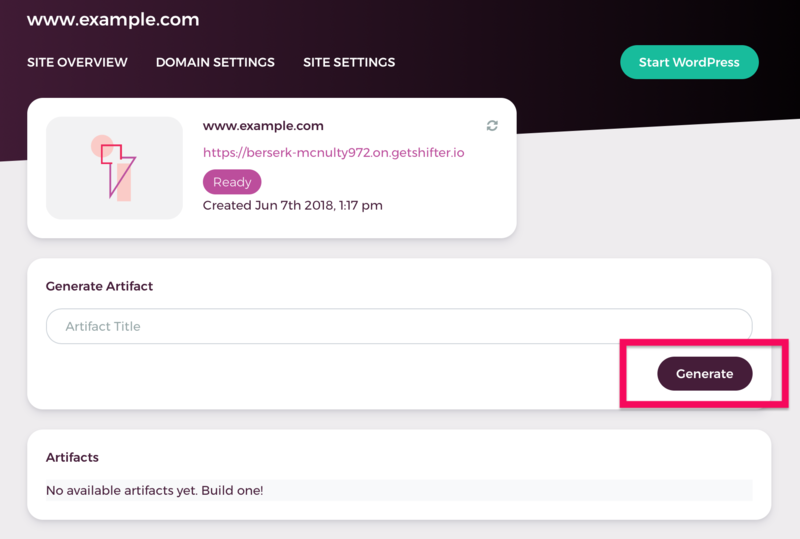 abcd-1234.on.getshifter.io) to your custom domain on your contents. 10. Access to attached custom domain. If you want to assign a non-www domain such as example.com, your DNS provider must support ALIAS Records. Non-www domains are commonly referred to as naked or apex domains. If you are not sure if your DNS provider supports them, contact your provider or check their documentation.